Tonight on Beyond Worlds we’ll be talking with Anna Klaffinger, creator of the Anna K Tarot. 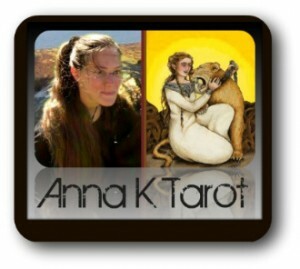 Philosopher, Yogi and Tarot designer, Anna began work on her deck when she was just 14 years old. She self-published it in 2009 and it sold out fast. Now it’s in its 2nd edition and we get to play with it tonight! Join Donnaleigh de LaRose and I live in the chatroom, or call in (646) 200-0765. § 2 Responses to Beyond Worlds with Anna K"
Thank you so much, Georgie. She was so much fun to work with. The type of gal I could spend the day with, shopping or going out for drinks. Nice! Delightful wasn’t she! But now I want to buy her deck!!! This show is going to bankrupt me!! You are currently reading Beyond Worlds with Anna K at The Tarot Room.